Union Home Minister Shri Rajnath Singh addresses the International Conference on Counter Terrorism, organized by India Foundation at Jaipur today. Following is the text of the Home Minister’s address. “Today much of the world is grappling with the scourge of terrorism and its dangerous consequences. Terrorism is seeking to destabilize the geo-political order in several parts of the world. It is doing so in pursuit of an insane interpretation of faith and philosophy that is violently anarchic and allergic to diversity which is the essence of humanity and its habitat. I firmly believe that Terrorism is a byproduct of a perverse mind. This perversion has no love for human beings or the humanity. Terrorism has no religion because religions do not allow crimes against humanity. Simply put, Terrorism is a crime against humanity. Unfortunately, while the world acknowledges the threat of terrorism, there is no consensus even on the definition of terrorism. The UN has adopted numerous resolutions to fight terrorism. All these resolutions amply show the resolve of the world. Sanctions stipulated by UN Security Council resolutions are often rendered ineffective by vested interests of some countries in the absence of a consensus definition of terrorism. The challenge of terrorism gets compounded when certain states use it as an instrument of their foreign policy. They make perverse distinction between ‘good’ and ‘bad’ terrorists. When the states begin covertly raising and indoctrinating bands of youth and equipping them with lethal weapons and weapon systems of mass destruction to promote their geo-political agenda, the magnitude of threat amplifies many times. It makes the task of defeating terrorism much more difficult. So long some countries continue using terrorists as instruments to promote their geo-political agenda, the fight against terrorism will lack due resolve. The world must accept the reality without any loss of time that there is no ‘good’ terrorist. As we struggle to arrive at a consensus on relatively simpler issues such as definition of terrorism, terror groups are becoming deadlier by the day. From traditional forms of terrorism, we are now witnessing cyber terrorism, narco – terrorism and bio terrorism. Use of dirty bombs also cannot be ruled out. Modern weapons, technology, and communications are being used by terror groups to enhance their lethality and impact. Revolution in technology including the information technology has brought marked improvement in quality of life of the people. Ironically it has also given unprecedented destructive power in the hands of the terrorists. Now they also operate in small nodes, widely dispersed, invisible and connected through digital networks. Never before in the human history, small groups of non-state actors could have access to so much destructive power. We are a country full of diversity with multi lingual, multi religious and multi ethnic society. These conditions are actively utilised by anti-national elements and other enemies to foment trouble in our country. To counter such threats we need to undertake sound preventive and responsive security measures. Most of the terrorist attacks in India emanate from Pakistan and it will have to show some sincerity and take concrete steps to rein in the various terror groups operating against India from its soil. If Pakistan takes concrete action against terrorists on its territory it will not only improve the bilateral ties between both the countries but also bring peace and stability in the South Asian region. The government of India will stand by Pakistan if it takes decisive action against terrorists and their organizations. For India Mumbai and Pathankot terror attacks have signified a tectonic shift. Mumbai terror attack in 2008 brought terror across the seas to our economic capital causing large number of casualties on innocent civilian population. Likewise in the recent attack on Pathankot air base, there was a conscious effort to target sensitive assets of the country and also cause large scale casualties, thus taking the dynamics of terror attack in India a notch higher. However, it goes to the credit of our security forces and intelligence agencies that they not only prevented any damage to our capabilities and assets but also achieved it with minimum casualties to own security personnel. Security Forces also ensured that there were no casualties to families including trainees from friendly foreign countries. For such a brave act they deserve the highest accolades. I can say this with conviction as terror attacks in the past on air bases of other countries such as Pakistan and Sri Lanka had led to major damages to their air assets including large number of casualties. After the Pathankot terror attack the government is reviewing its Counter Terror strategy. We are now formulating an effective strategy which would help in preventing our country from such terror attacks in future. We are fully equipped and prepared to deal with Cross border terrorism or any kind of terrorism. We are working on a National Security Strategy aiming to achieve seamless coordination between all the agencies. We had advance intelligence input on Pathankot. It helped our security agencies in neutralizing the possible impact of this terror attack. Proper assimilation, analysis and timely sharing of intelligence inputs hold key to any successful strategy against terrorism. The government is increasing its capabilities in this area as well. We are also stepping up vigil at our international borders and strengthening our border infrastructure to ensure fool proof security in the border areas. We also solicit and appeal for full cooperation on issues pertaining to National Security from opposition too because we need to rise above partisan politics on issues of national importance. Lack of consensus on matters like National Security will adversely affect the country’s national interest. It is a cause of grave concern that the Cyber World is being exploited by terror groups such as DAESH or ISIS to radicalise the gullible youth of our country. Since many security experts and intellectuals are present here, I appeal to all of you to use the word DAESH to mention ISIS in future because this terror organization is seeking legitimacy through the word ‘Islamic State’. The Cyber world is also enabling ‘Lone Wolf Attacks’ across the world. Exploiting the power of internet and ideological motivation, terror groups like DAESH and Al Qaeda have already flooded the internet with literature pertaining to bomb making and suicide attacks which present a risk of emergence of ‘DIY’ (Do it Yourself) Terrorists. India also needs to be mindful of this possibility. We have adopted a multi pronged strategy against the attempts to radicalize the youth of the country. On the one hand we have successfully de-radicalised our youth and on the other hand our security agencies have also taken action certain individuals for their links and association with terror organizations. The security experts believe that India’s strategy against radicalization is far more positive and effective than other countries of the world. We are hopeful and firmly convinced that together we can neutralise any threat to our country. We also would like to assure various dignitaries and participants from friendly foreign countries that India stands firmly behind the International Community in the fight against terrorism”. The Union Home Minister Shri Rajnath Singh reviewed the performance of the Police Modernisation Division of the Ministry here yesterday. During the meeting, various issues including modernisation of State and Central Police Forces, Provisioning/Procurement of specific items such as clothing, tents, equipment, arms, ammunition, vehicles etc. for CAPFs and Central Forensic Science Laboratories (CFSLs) and monitoring of Police reforms were discussed. Shri Rajnath Singh appreciated 85% release of funds by the MHA to the State Governments under the Modernization of Police Forces (MPF) Scheme. He also directed for release of Contingency Reserve Fund without insisting Utilisation Certificate as a special case this year. He advised for effective implementation of Mega City Policing in a time bound manner. 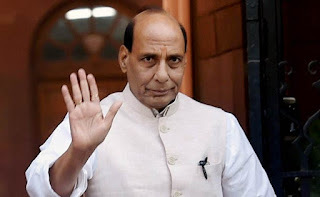 Shri Rajnath Singh appreciated the efforts for achieving the targets for approving qualitative requirements(QRs) and Trial Directives(TDs), achieving 75% expenditure levels in CAPF General and Plan budget. The Home Minister has also advised the Division to achieve cent-percent utilization of budgetary provisions for the current FY. Shri Rajnath Singh appreciated the achievements towards procurement of critical items for CAPFs and other prominent central agencies. Regarding shortage of scientists in Forensic Labs, the Home Minister agreed to the suggestion of utilizing the services of retired forensic experts and contractual staff in order to reduce the pendency, particularly old cases. He advised to chalk out a plan for establishment of a Central Forensic Police University. He also appreciated the efforts of the PM Division for bringing up proposals for initiating manufacturing for ammunition through a newly set up PSU under administrative control of MHA to supplement the Ordinance Factory Board. Shri Rajnath Singh appreciated the preliminary studies of Division in integration of mobile and MHA wireless networks (public and captive communication domains) and up gradation of the POLNET network. He further directed that more regional workshops be conducted to elicit public opinion and feedback on the draft Police Bill and also advised that SMART Policing and Community Policing initiatives should be incorporated into the action plans of MPF scheme. He further directed that the MPF Umbrella Scheme be finalized early in consultation with the Ministry of Finance.